Presented here are two listening guides as a means to do a comparative analysis of these two performances of the Steve Lacy composition, “Who Needs It,” performed by Steve Lacy, himself, on his classic CD, Sands; and Branford Marsalis, on his CD, In My Solitude: Live at Grace Cathedral. These performances have two things in common. One, they were both recorded on the soprano, and two, they both were performed solo (unaccompanied). 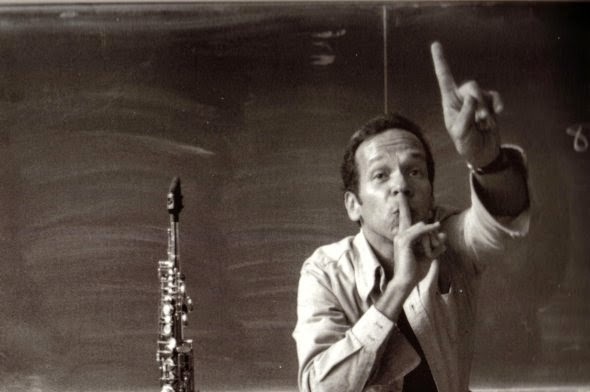 Steve Lacy, as most fans of his music already know, recorded a voluminous amount of solo saxophone music. Coleman Hawkins may have popularized it, but Lacy certainly turned it into an art form. In My Solitude: Live at Grace Cathedral is Branford Marsalis’ first full-length solo saxophone CD. And I say, “full-length” because Branford is no stranger to playing solo. In fact, there was a time he would play Sonny Rollins’ “St. Thomas” as an encore. No easy feat, I might add. But he did pull it off quite effectively. When you listen to the way that both Lacy and Marsalis interpret this piece, it’s pretty obvious that their styles vastly differ. Lacy is a minimalist and is economical to a fault; while Marsalis expertly walks that fine line between flash and taste. Lacy’s approach is more sound centered, whereas, Marsalis tend to be more idea-centered. 0:00 – Plays the main theme in the key of Gb major. 0:23 – Plays the theme again with little variation. 0:45 – Staying true to his very disciplined minimalist approach, he plays the theme a third time with little variation. 1:07 – He then plays the B section, which is the theme in the key of G.
1:29 – Improvises in Key of G.
2:09 – Returns to the main theme, the A section, in the key Gb major, modulation down a half step. 2:30 – Plays the last two bars of the theme, three times as a type of coda. 0:10 – Theme 1: (After the applause ) Marsalis plays the theme somewhat fragmented at a mezzo forte volume. 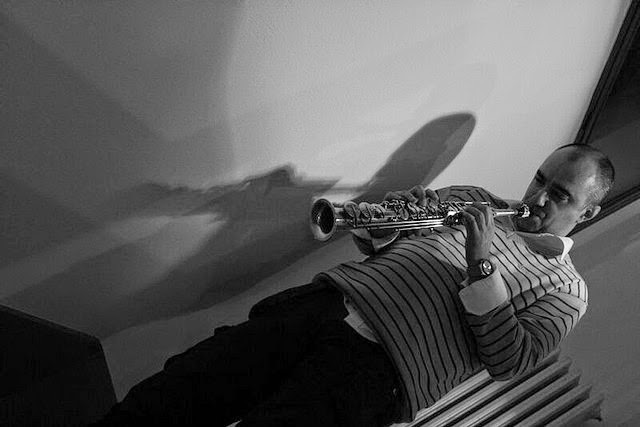 0:33 – Theme 2 – When playing the main the 2nd time, Marsalis begins at almost a whisper as a way of enticing the listener, while at the same time playing the melody even more fragmented with brief moments of silence that makes the theme feel more suspenseful. as a way to keep the listener from settling into an aural comfort zone. 0:56 – Theme 3 – Marsalis begins the theme this time around at a much louder volume. He also plays it less fragmented. 1:13 - Theme 4 - Unlike Lacy, Marsalis continues in the key Gb. 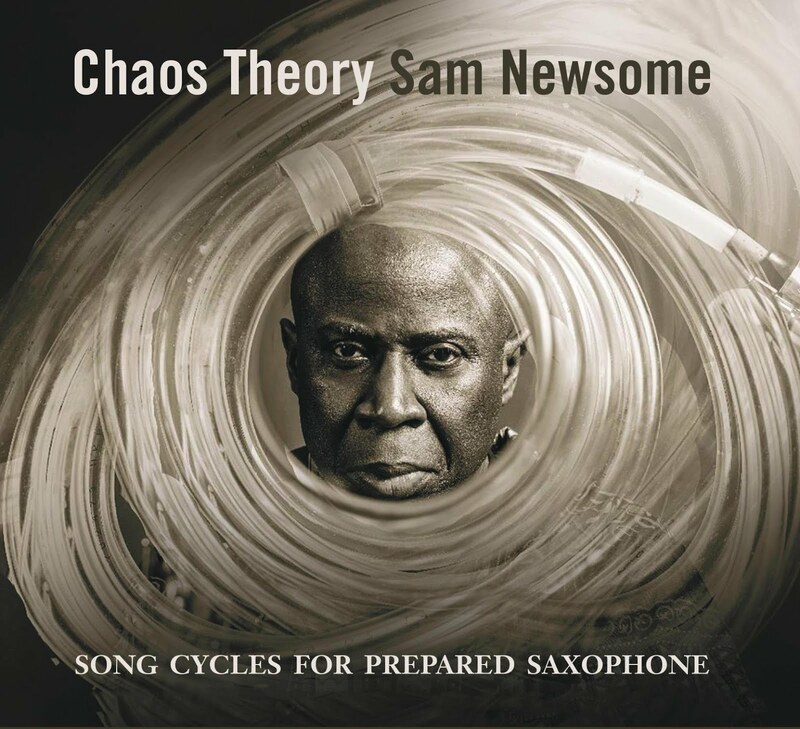 He begins by referencing the theme, which organically morphs into an improvised solo. 1:30 – At the end of this theme variation/improvised solo, Marsalis loosely plays the last two bars of the theme as the 1st melodic cadence, marking the end of the section. 1:34 – At this point, Marsalis has totally broken away from the original theme and has begun laying his melodic groundwork in the key of Gb major, with a very active improvisation. 1:51 – References that last two bars as for the 2nd melodic cadence that sets the stage for a more elaborate solo. 2:14 – Loosely references the last two measures for the 3rd melodic cadence, which sets the stage for more improvisation laced with more improvisation. 2:26 – Abruptly changes the tempo to signal the coming of the last theme. 2:49 – Loosely references the last two measures for the 4th melodic cadence, which sets the stage for him to play the theme in the key of G major by loosely referencing it. He proceeds with an improvised solo in the same key. 3:21 – Plays the 5th melodic cadence to set up the performance of the last theme. 3:25 – Plays the last theme in the key of G major, playing the last two bars three times as a coda. 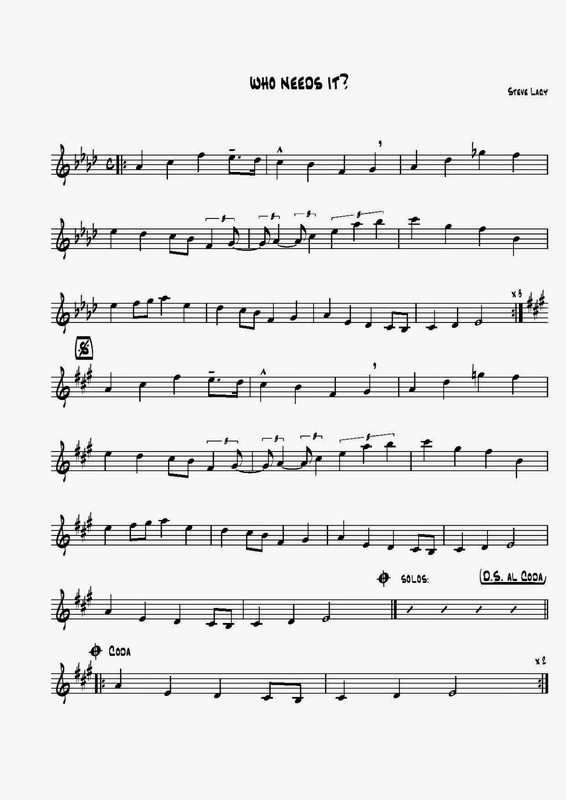 REVISION: After I posted this originally, soprano saxophonist Stefano Scippa informed me that he transcribed "Who Needs It" some time ago, and was generous enough to let me post it. FYI, this is a Bb part, in the key of the soprano. Thanks, Stefano! The following interview with Italian soprano saxophonist Stefano Scippa was conducted several months ago. During this very telling conversation he enlightens us with insights learned from private lessons with Steve Lacy, playing jazz in Bologna, and of course, the fascinating story behind his compelling solo saxophone CD, Immaculate Breakfast. In recent times after many years of intense activity, I felt the need to retire from music for a while, having lost interest due to the general lack of ideas and creativity on the scene. Not being able to find any pleasure in the practice of music, I considered the eventuality to quit altogether. So, with the exception of few isolated appearances, I decided to limit my playing to single weekly sessions just to keep physical contact with the saxophone. All this took place in a very special space: the chapel of the former mental institution Roncati in Bologna. There, nestled in a sort of retreat, the ancient hall halo became an instrument itself, in the form of reverberating waves produced by the same horn that had lost any appeal to me. The rise of vibrant, unearthly sound returned to me the original meaning of music I experienced many years ago. This time committed to such a lonely search showed me a direction that brought my style to maturity and a certain formal completion and these recordings are the outcome of two years hard work. SN: Before we address what you wrote in your liner notes, I’d like to catch my readers up to speed on who you are what you’ve been up to these last several years. So when did you decide to make the soprano saxophone your main instrument? I played in many projects and combos: mostly acoustic and small sized, with the exception of a couple big bands. 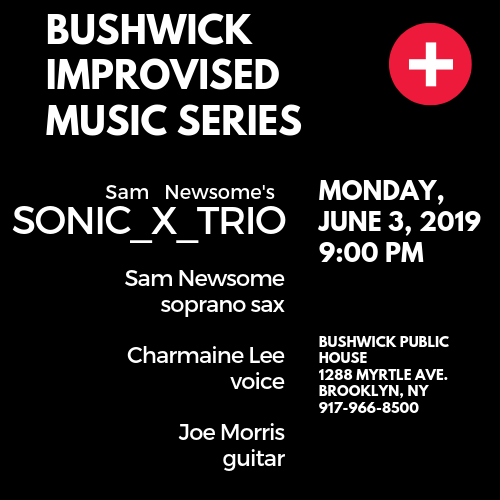 The projects range from mainstream jazz to traditional inspired ensembles, from free improvisation to early sacred music, not to mention some classical music. Another part of my output is into film music, television and contemporary theater. The element that remains constant in all these different types is a component of improvisation. The soprano sax impressed me at first for its tense and modern sound. I thought it was representative of our time. Its liquid quality makes one think of molten metal. The horn design itself has an appeal: the intricacy and the sparkles, the mysterious keywork. So by the mid 90's I decided to add it to the clarinet, which I was playing thinking of a tenor sax. At some point I began to perceive the clarinet sound as limited and outdated, so I gradually switched to soprano until the transition was definitive. Ultimately I did the same route of Sidney Bechet. Today, I think of the soprano like a trumpet and that's funny because I always played one instrument thinking of another. But I think it’s necessary. If you play the same instrument for so long you need to invent something to get the rid of boredom! SN: Were there any players that influenced your decision to play the soprano? Or were you solely influenced by your own connection to the instrument? Regarding the soprano, there were also external influences. 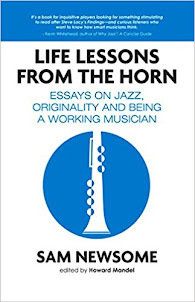 I came in contact with the horn when I saw some experienced colleagues in their concerts: the soprano had such an incisive sound, at the same time was close to the human voice. The speed of execution and the chromatic phrasing were among other elements that struck me. But it was when I heard Coltrane on My Favorite Things that I experienced a real epiphany! That was the decisive moment in which I resolved to take on soprano. I must have heard that song a thousand times? Lacy was also obsessed by sound. But on that subject I wasn't unprepared, since my first teacher, Oreste Sabadin, had instilled in me the same care for the sound. And he's definitely my first and fundamental reference point. Thank you, Oreste! SN: You said that Lacy visited Italy a lot and you had numerous opportunities to hear him play. Was there any particular concert that stood out? Also, did you get a chance to sit down with him and talk about music and the soprano? SS: I heard Steve live for the first time in 1994, in Padua, where he was studying. The trio with Irene Aebi and Frederic Rzewki on piano, presented Packet, a program of songs built around the poems of Judith Malina. A that time I had heard only Lacy's classics like Soprano Sax and Evidence. I wasn't not yet mature enough for that kind of music, but some fragments impression. But some years later I happened to get Packet CD and really enjoyed the music. Both lyrics and music are beautiful, the contribution of Rzewsi helps to project jazz language into a chamber music setting without forcing. I consider Packet Irene Aebi's best work, since her vocal qualities find their natural place. To this day it remains one of my favorite Steve's albums. The saxophone opening projected into the piano chassis has such a profound and evocative power that breaks the acoustic limits of the instrument. Later in '98 I came to know that Steve was coming to Bologna for a masterclass. It was a wonderful opportunity to meet him, so I couldn't miss the chance. Steve nice and english demaneored, he really made me felt at ease. In the class many exercises consisted in the collective delivering of themes or group improvisations. There must have been at least a dozen saxophonists, and more than a half were soprano players. I placed a small analog tape recorder next to me, but when I went home and I listened back to the tapes I realized the sound was saturated and distorted. It was almost impossible to tell a single instrument out of the crowd, with one exception: Steve's sound was always there, distinct and clear, with the same features that you can listen to all his records! It was the biggest lesson that I received on sound, and without a word! I realized that Steve had probably found a way to take advantage of some particular frequencies different than those of all the others, and that these allowed him to emerge. Its uniqueness was thus revealed. The following day Steve explained to me and Gianni Mimmo how to deliver harmonics. I remember the three of us having troubles to play the fourth harmonic out of the middle C sharp. What a joy when I was the first to succeed. Steve congratulated me and he signed a nice dedication on a photo: "Good luck with the horn" Horray! SN: Is there much of a jazz scene in Bologna? There seems to be a lot of wonderful jazz musicians coming out of Italy. SS: The city of Bologna and Italy in general, have always been a major landing point for the world of jazz, and the best musicians are regularly invited. By doing so, Italy itself has produced first class musicians. Today, however, the prevailing logic is that of small groups who care only for their interests rather than being supportive one to each others. In Bologna, only a few venues survive and it's very difficult to play. A few festivals are accessible only to the big names. The same is true for the theaters and the media that are controlled by institutions with strong political connotations. The result is a general lack of creativity and stagnation. The remaining chance for the independents is to take the burden of organization the financial risk. Personally, I’ve produced many events, like the Eaunaturelle Festival. Even doing so the institutions run by politicians tend to ignore the private to stop him in the long run. Being that Italy the birthplace of the Renaissance, it is necessary that artists collectively exceed their personal limits and work together to overcome this system. In these days I see a lot of musicians, even professionals, who are returning to play in the street to make ends meet. Who knows? Maybe this will do good to them and their music! SN: Can you talk a bit more about the Eaunaturelle Festival? SS: I decided to organize a festival of avant-garde music ( regardless of genres ) in 2006 and 2007, with many spinoffs during the year. 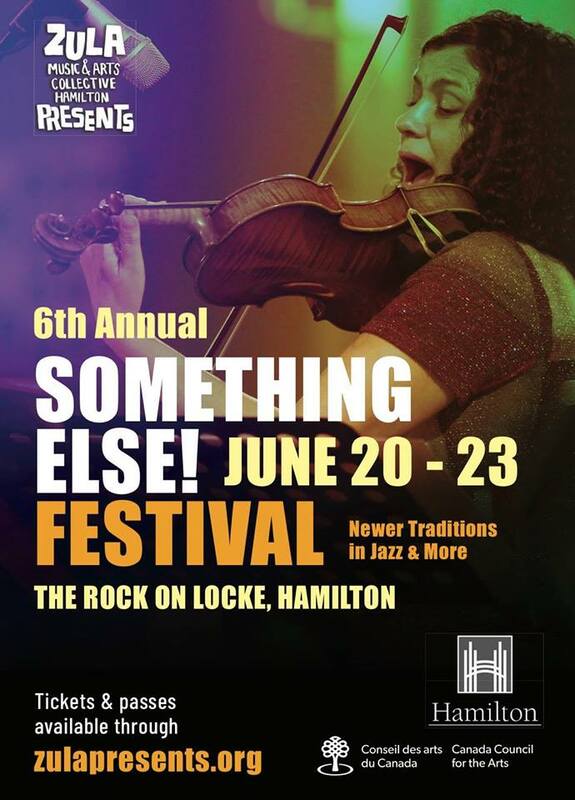 It's hard to be part of small circles of musicians so I decided to do a festival of my own. Back from a trip from Berlin I had so much energy I felt confident enough I could do whatever I wanted for at least two years, and so it was. The festival was an independent success, I invited several guests from abroad and let them play with local artists. On that occasion I invited Joe Giardullo with whom I also made an soprano duet. My goal was to create a bridge between musicians and hopefully let them understand that joining they could be stronger and realize their projects. Unfortunately I failed this goal: at the end of the festival everyone returned home and resumed their individualistic attitude, with a few exceptions. I realized that most of the musicians have this kind of mentality and I could not do nothing except become a full-time organizer and fund them. Anyway, I became aware that I was able to create and manage a festival in all its aspects, from the programming of websites to fund raising and logistic. Everything went smoothly and there were no major issues. I do not exclude to repeat similar experiences in the future. SN: Can elaborate on what you mean when you said that politicians in Italy run cultural institutions? SS: I remained vague on this point not assume a polemical tone. But since you ask me I will explain. In Italy, if you have the chance to finance and organize your own events you can go forward on your own and overcome many bureaucratic obstacles. If you succeed then you eventually present your works to institutions but probably be ignored. Cultural institutions are controlled by politicians and prefer to finance associations led by militants of political parties. In this way public funding, which should be donated to the citizens, they become a mean of exchange to get votes. In this system the independents do not have space and oxygen, they can rely just on themselves and in long period they loose stamina. For example: Although the Eaunaturelle festival was an international event articulated in three cities the some press ignored it because I had no political support. Currently in Italy if a citizen writes a letter to a councilor to present a project in many cases does not even get a response. The distance between citizens and institutions is enormous. 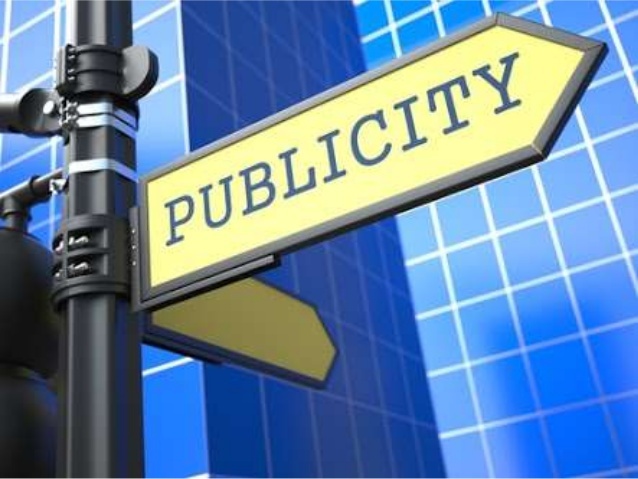 The only way to go is to be associated to politically deployed groups or be independent and self-finance, but you know well how difficult it is for musicians to assume that responsibility. SN: In your liner notes you said that you “felt a need to retire.” Was there any one particular thing that happened, or was it just that overall desire to play music had disappeared? SS: It was a personal matter, but the story of an individual is also set in a general context which is what I just described above. The personal aspect relates to a declining interest in music and the instrument itself. For most of my life, music has been the inner spring of creative energies. As result of a period of professional activity, the wells were drained and the inspiration dried up. The sound of saxophone left me cold and the horn itself, turned upside down, looked like an Art-deco flower pot. I was saturated. The thrill was gone and the music that was once a source of regeneration was now a hollow room. I decided to take a long break. A colleague advised me to have fun and do things other than music but encouraged me to keep a physical contact with the instrument, just by touching it from time to time. So I took his advice. I'm not afraid to say I felt good without music, but I was aware it would have been a waste to throw it all away. I made up my mind to play once a week in the chapel of what once was the former mental asylum. I got into the habit of recording weekly sessions, and over time I realized they had a poetic beauty of their own. I found motivation and decided to set up a program to produce my first solo album. SN: Is it safe to say that Immaculate Breakfast was not just about making music, it was also a form of therapy. SS: The place that gave birth to Immaculate Breakfast had a life of his own. The chapel reverberation mirrored the sounds back to me like an orchestra. In the hall that was once a church I could recollect my musical origins. I was surprised they were the same simple ideas I had in the theater days, so I just included in more advanced structures. It was truly a form of self-therapy and regeneration. At the end I was so happy that I decided to issue it with my label Contains Beauty. The last piece, the title track Immaculate Breakfast is the core of my musical concept packed in a few minutes. Incidentally this piece was the first to be recorded as a casual improvisation to test a new horn. In a way I consider it my poetic synthesis. Immaculate Breakfast is also an idea, a container functional for different type of performances, like theater. In a way it's a method to take care and feed yourself with the purest elements to survive artistically. When I work as an art or music therapist, I aim toward specific therapeutic goals. Similarly when I play music I need to do things I acknowledge as true. In the era of technology Immaculate Breakfast is also a way to present the human being in front of an audience: naked, armed only with an old instrument and few ideas. Even if it may seem obvious we have to confront the real challenge - which is even more urgent in music. Is still the real human being to prefer over tech devices? SN: How did you become interested in improvised music and more importantly, playing solo? SS: I became involved in improvised music for simple reasons. As everyone else I was deeply impressed by certain recordings, then I had friends who were playing jazz and that was certainly an influence. Improvisation is a softer and more funny approach than academic music. In improvised music the individual has room to express his personality. As you improve you soon realize that excellence is no less demanding than in classical music. The artist evolution is a process: you add some elements and take away others, then eventually come out with your unique mix. After all the search for the artistic self and your own voice is not very much different than life, where you have to find your place. About solo performance I think that in the end we play solo for most part of our life. So the difference is when you decide to do it in public. When you're young a narcissistic component is a necessary part of the game, but later on when you are mature, it's substituted by need to pass your experience over to others as a form of altruism. It's the alchemical process of an individual who proceed form a starting point of egotism - the need to take - which is what permits the baby to survive - to a position of extroversion - the desire to give the best part of you . Which is a form of love. Of course playing soprano solo it may also result out of the desire to confront yourself with a tradition ( Braxton, Lacy, etc. ). Sometimes it happens simply because you can't find the right partners to express a certain ideas. It's clear soprano today has a consistent solo tradition and it's common practice for dedicated soprano players do at least one solo recording. Sometimes I think that soprano could become the contemporary violin among winds. SS: I’m familiar with your CD, Immaculate Breakfast, obviously, but are there other solo recordings that you’ve done that you would recommend? 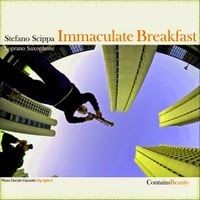 SS: Immaculate Breakfast is my latest and only solo record so far. 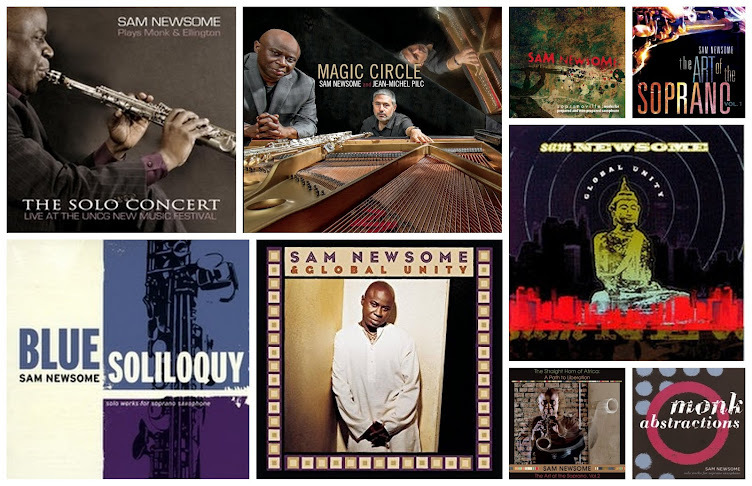 Before that I produced very different type of albums because I do not like repeat myself, but I play exclusively soprano saxophone on all those records. Albums focus on different genres. One of my favorite is Rebirth Of Divine, a trio with Arabian oud and cello. The project is based on early sacred music and Gregorian chants. Early European music is a founding value to me, more or less like Afro-Americans would instinctively recognize the blues and spirituals. I also played some solo in that record, something I perfected later. Caffè Luce is the reduction of the traditional Italian band to a quartet including accordeon. The repertoire is made up of folk songs and original compositions. Another project issued under the title Eaunaturelle was the outcome of the collaboration with american cellist Tristan Honsinger - possibly the father of improvised cello. The music is organized into open structures and intuitive music strategies. An important stage of my life, Tristan taught me that there's no difference between life and music as the latter reflects the other. It was the most extreme form of musical freedom I experienced, but not easy to practice as someone would think. SN: Are there links where we can buy Rebirth Of Divine and Caffè Luce? SS: My distributor is Cdbaby. My records are also available on iTunes. SN: What do you find to be the most intriguing thing about playing solo? And feel free to expound on any challenges that you have faced, too. SS: For me, today the challenge is to tell a story structured in different episodes – eg. the tunes - and set it into a musical frame as a theatrical metaphor. In order to have a certain authority you must already have developed your own unique sound. You can use that sonic blueprint to glue different genres of music. That's something you would not normally do in a quartet, where the repertoire is more singlely oriented. But playing solo allows you some kind of freedom. By the way, you also need to add variety. You balance space and density, silence and sound, use different colors and dynamics, choose between several moods and tempos. You distribute all these elements to characterize each tune differently. In the end this is what do in any kind of successful performance. All you have is a certain amount of time and you fill it with selected actions. Some are repetitive and necessary, others are at your discretion. The same is true of life, you can expand reality drawing from your imagination, you can create something that didn't exist before. For the aspiring artist it's a form of intellectual honesty at least to try and not just keep repeating what others already did. That's what art is all about. By the way, being an Italian, I believe the feature that most distinguishes us from others is melody, if you think, for instance, of the opera. So I choose selected melodies or melodic modules and use them in my performances as narrative anchors. SN: I’m going to change the topic slightly and talk shop. What kind of set-up do you play on? 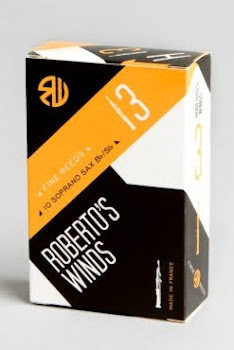 SS: On soprano, slight changes are radical. Yet after many years it surprises me how my sound stay more or less the same with any kind setup. So, if I wish to alter the color it's mostly about nuances and inflections. That has a lot to do with the throat position. I play a silver plated Selmer MK6. I always had a preference for silver horns over lacquered. I think silver have a deeper sound and better projection. With time the sound center grows bigger and darker, at least in my case. For the mouthpiece, after many years of rubber, I passed to wood because I feel it combines the qualities of ebonite and metal with a plus: it's a living material. I'm currently using a superb Sopranolanet 8* wood mouthpiece that Joe Giardullo custom made for me. I play different reeds depending on the music or the acoustic: Vandoren Traditional # 2 for classical, Alxander DC #3 and Marca Traditional #3 for other genres. I use a Winslow ligature for a wide dark sound and Oleg for a more brilliant one. One of the features I like most is that breath sound, that ffft... that sometimes occurs shortly before the attack of the note. Most times is random, an unwanted noise. On the contrary I try to include it as much as possible in my playing. For this reason I was once banished - I must admit correctly - by the director of a contemporary music ensemble. Today I'd certainly make the director happy with the proper attack, but at that time it was more important to protect that forming ffft... rather than playing a classical setup and stay in the orchestra! Anyway, I believe the reed is the most important element above all others. Sometimes we discard a mouthpiece or we say the acoustic is bad. But actually it's the reed that is unfitting. I made this discovery some years ago and I'll never forget it. I was tired of my piece and I casually happened to try a new brand of reed, the sound doubled and the effort halved! Isn't it for this that the instruments we play are named reeds? SN: Being someone who focuses on the soprano, do you find that you think or play differently than when you’re playing one of the other saxes? SS: I do not come from other saxophones like many do, I consider myself a pure sopranoist. I seldom play other horns, it's something I do when I need a really different color, just like a painter would do. On the other hand you can treat your instrument as something different. That may prove necessary if you have an exclusive relationship with soprano, the tyrant par excellence. I find that alto and tenor are generally easier to play and articulate but I have to adjust the air column, the air speed is slower and I can easily find myself playing overtones! I can make a correct comparison with the clarinet. The clarinet has a more imaginative phrasing for the upper register is a twelfth apart and you got more notes in the bottom. It's something I miss on soprano but the clarinet sound has a stronger connotation and I think on sop you have more choice to develop a personal sound. I will explain this. When I was at the conservatory I made up to discuss my graduation playing solely soprano, a risky choice! As part of the discussion I wanted to give evidence that the limitations of the soprano were mistaken. I prepared to play all three the horn solos of Flamenco Sketches along with the original recording, in the same texture of the original instruments and trying to imitate their peculiar sound. With the exception of a few note of the alto and some scale runs of the tenor I accomplished that goal and I'm very proud of that! Someday I will put online the adapted charts for soprano geeks. The horn gas certain restrictions but contains other elements you can master. Let's extend this idea to the musical transposition of life: you can easily imitate a flute, a crying baby or a lonely dog barking at the moon. But how would you represent a shooting star? That's has more to do with poetic skills and that is what I'm about! SN: Are there any future recordings or projects that we can look forward to from Stefano Scippa? SS: My the next record will be Domani. I'd like to play the material with different combos and sounds. There are original contemporary compositions, traditionals and some very ancient music dating back to the fourth century B.C.! I will also include some solo version of the baroque repertoire never recorded on soprano. Soon I'll release Satori At Fall, a collections of jazz tunes played in a very free way by a piano less trio. When available the album can be downloaded for free at the website www.containsbeauty.com for promotional purpose. There are other things I'd like to do. I dream of a small contemporary sacred music ensemble, an evolution of Rebirth Of Divine. While Immaculate Breakfast, has already became a theater play commissioned by the Winds & Bits festival in Rieti. A solo performance in which I play the role of the narrator and musician, inspired by the figure of the early bards, the wandering storytellers of Greece who sang their epics, accompained only by their instrument. I consider theater the most complete and elder art form , since it includes all others artistic disciplines including music. Life itself is the most direct source of theatrical representation. SN: Thanks for your time. And thanks for your insightful thoughts. During the making of my new CD, I contemplated many thoughts about race, liberation, and African culture. So much so, that I felt compelled to write them down daily, which, consequently, served as sources of inspiration throughout this creative process. 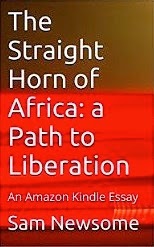 And all of these things came together in this new e-book: The Straight Horn of Africa: A Path to Liberation.